Yesterday's post topic got a lot of great feedback. Thank you for that! It stemmed another question, one I hear discussed often. But since I have your attention I thought I'd follow up with it here. The short answer is - Detatch in the spring. Aerate in the fall. The long answer is as follows; (see my last blog post on dethatching) Dethatching breaks up the mechanical properties of the plant. Don't think of your lawn as one plant but rather a community of thousands or millions of individual plants. Dethatching your lawn will help individualize the plants as they were last fall before the snow. Perrenial grasses like we have here in NH go dormant over the cold winter months. Once the soil temperatures stay consistently above 60 degrees during the day and 40 degrees at night, grasses will come out of dormancy and actively grow again. So when you're dethatching the lawn, think of the process as breaking the lawn out of it's dormant state. Open up the void space between the plants. That's where they will be taking in what they need to start growing and spreading again to fill out and green up your lawn. 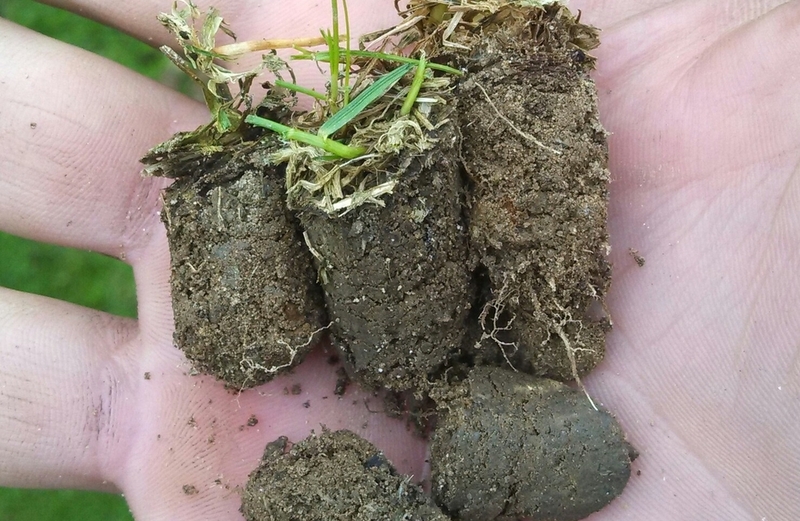 Aerating breaks up the soils and agitates the root structure of the plants. So while I am a huge advocate for aerating, it's a fall chore. There are exceptions to the spring/fall rules though. In short the rules don't apply to serious amendments to the lawn and with that consideration, break the rules. For example, last spring my lawn was entering it's second growing season. It was installed with heavy equipment. The top soil I was sold was not the greatest and the first growing season was very dry. The front lawn was hydroseeded and after a bad experience with that, I seeded the back lawn conventionally with better success. The front lawn had a crabgrass infestation before the lawn could establish. I began what I had planned to be a two year process of resurrecting the front lawn. I aerated early in the spring and over seeded immediately. About a month later, once I knew the new seed was strong enough to withstand chemical treatments, I killed the annual. I sprayed a crabgrass killer. I found out just how bad the lawn was because anything that wasn't perennial died and turned brown. I aerated again and mowed the lawn very short. About a month later I treated one last time for crabgrass. By now the new seed from the spring had become grass and green was making it's comeback again. More on this experience in a later post. But my point here is that what I'm telling you isn't rule, any gardening endeavor is an experiment so challenge conventional thought and get creative. I'm doing my best to explain the fundamentals. I know a lot of my readers aren't physically getting out there and running behind the aerator, they simply want to make informed decisions when applying hard earned dollars to their properties. So whether you're the do-it-yourselfer or the inquisitive homeowner thanks for reading, I'll get back to the topic of discussion. Aerate in early fall. September is ideal. If you've had foot traffic or a heavy lawn mower running over your lawn all summer it's time to open up the pores and let her breath. I like to plan an aeration a week or two before a fertilizer application. The biggest reason that the spring is not the season to aerate is crabgrass. Crabgrass seed is dormant until soil temps reach the 80s during the day and a chance of frost is gone. So if you, your neighbor or the truck driving by with grass clippings in the bed, have any dormant crabgrass seed blowing around it will have a much easier time germinating in that nice little hole you made for it with your aerator. This goes double for those of you who spread a pre-emergent to keep the crabgrass at bay. The pre-emergent acts as a barrier only allowing the perennial grasses through and once you poke holes in that barrier by aerating, goodbye lawn, hello crabgrass. In the fall crabgrass has gone dormant weeks before perrenial grass says good night. With the crabgrass dormant you'll be safe to poke holes for the health of your perennial grass lawn. Spring: Break it up and Rake it up! Fall: Open it Up before Closing it Up. So in the fall plan to aerate, overseed, wait a few weeks, then fertilize and by spring you'll be good to dethatch and spread your crabgrass preventer. Hello Lawn! What can you expect to pay? If you rent a machine yourself you'll be paying $75 for a weekend that you'll probably feel for the rest of the month. If you have it done by a professional you can expect to pay a range of rates from twice the price of the weekly mow to $100/hour. Aerating is taxing work but requires no real skill so shop at will. Big things to watch for when aerating: Invisible dog fence, sprinklers, drainage and and other shallow run utilities. So survey your property and mark everything before aerating begins. We run the sprinklers and locate dog fence to thoroughly mark utilities before aerating.